I get a lot of email inquiries via this blog asking about doing the Yading kora. I'm leaving this here as a reference to answer some of the most common questions. If there's anything I've not covered, let me know! How often do you get to see three amazing and very distinct mountains in close proximity and have them all to yourself? This is a trip through a little travelled and unspoiled alpine area where you will meet few if any other people for a week. As well as the spectacular alpine scenery (including glaciers) the area is a treasure trove of rare flowers, plants and tree species. You will also see a wide variety of wild animals and birds. Yading is also rich in Tibetan Buddhist culture. The kora itself a sacred path for Tibetans, but for some reason the outer kora has very few pilgrims compared to more popular nearby routes such as Kawakarpo in Yunnan. As well as being a pilgrimage, the kora is also a great physical and mental challenge. Can you survive in the wild without access to shops, houses, electricity, roads - and the net or mobile coverage - for a week? 2. How long is the trek? I really don't know! I'd guess about 100km, but thinking of it in terms of distances from A to B is unhelpful anyway. The full kora takes seven days at a moderate walking pace of a fit adult, allowing for an average of five hours walking per day. You could do it in five days (we did) if you walked flat out, but this would be horrible, exhausting and leave you little room for error or seeing and exploring the many sights along the way. 3. What's the terrain like? It's mostly above the tree line on open hillsides and mountain slopes - that means walking on sometimes steep slopes exposed to the elements - wind, rain, snow and sun. 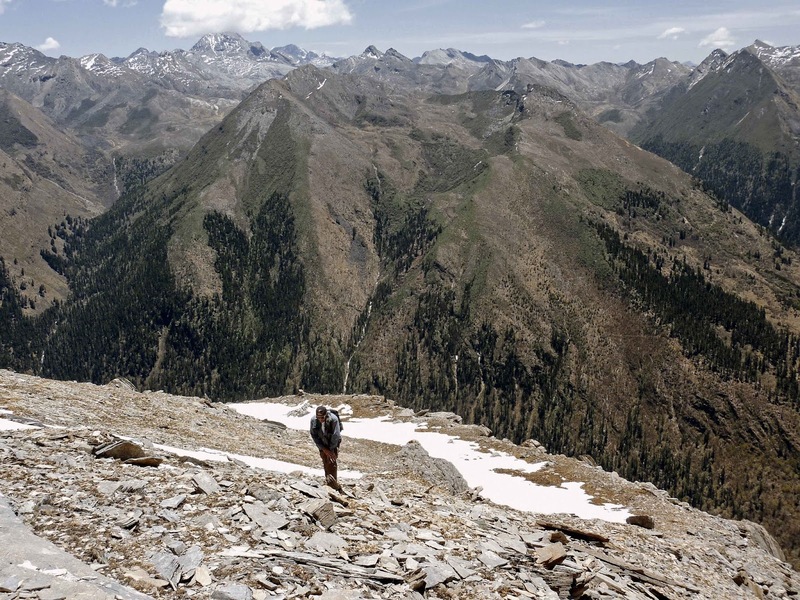 You'll be walking on terrain covered by low scrub along muddy trails, up scree, on glaciers (if you want to) through stream beds, over makeshift log bridges, and occasional scrambling up rock and clay inclines. There is some walking through forest and also some walking along exposed alpine trails where you will need a head for heights. 4. Fitness? Experience? How difficult is it? It's not a technically difficult walk apart from the odd sections that require a bit of scrambling. It can be done by a reasonably fit person who has stamina and can put up with bad weather, rough terrain and most importantly, altitude. It's not a walk for kids, your gran, or anyone with health or disabilities that limit their exertion - and it's not something you'd do on a whim and without proper gear. You need to be experienced in trekking in wild country and also able to endure some serious exertion, slogging up hills to altitudes of almost 5000m. You need to be able to balance on boulders, slide down muddy slopes and endure rain and strong winds. That makes it sound really arduous, but much of it can be pleasant and relaxed in the right conditions - I'm painting a worst case scenario. You will need to be self sufficient and carry all your food and camping supplies. This means either carrying a 15kg backpack (I couldn't do it) or having a porter with a mule to do the heavy lifting. It also requires some psychological robustness, especially if you are travelling alone (albeit with a guide) and can't speak Chinese. What was that moving outside the tent? Did I leave the gas on? There are no small-scale local and accurate topo maps of Yading that I know of. Some aerial pilot charts cover the area but they don't have enough details and the tracks/roads etc are hopelessly inaccurate. There are some Chinese hiker-compiled sketch maps (not to scale) and larger scale Chinese maps of the area, but I have seen nothing comparable to the British Ordnance Survey standard of maps. However this is the age of Google Earth and its zoom/3D functions allow you to get excellent resolution and scale for the entire Yading kora (if you know where to look). I have included screengrabs on my blog. This shows you can visualise even individual huts along the kora with Google Earth/Maps. And surprisingly the locals do not have access to such detailed views because Google is blocked in China - so take printouts or keep copies on your phone/tablet. But even with maps the route finding is not straightforward - the trail is unmarked in many places, except by occasional piles of stones. Sometimes there are confusing multiple trails, some leading down dead ends or to areas beyond the kora. Please don't ask me about GPS and waymarkers. I'm a technophobe, I know nothing. 6. When's the best/worst time to go? There are only two narrow windows in the calendar when the kora route is walkable and with chances of clear weather to see the mountains: late spring (late May, early June) and autumn (September and October). The best time to go is autumn. The rainy (monsoon) season starts in early June and lasts until the end of August. At this time you will likely get low cloud and constant rain, with no views. Believe me, I've walked it for seven days and you need good waterproofs. In winter and up to May the route is snowed in and you can expect subzero temperatures at altitude. Conditions underfoot will vary from treacherous to impassable. Snow and ice return from mid October. Even at the peak periods the weather can be highly variable - it may be scorching in the rest of Sichuan but we have had blizzards in Yading in June. The other two factors to consider in timing are the peak Chinese holiday times of the Golden Weeks (around 1 May and 1 October) when Yading will be packed with visitors (Warning: entry is sometimes restricted to online pre-booked ticket holders during these periods). Hiring a guide will be difficult in spring because it is the season for harvesting the lucrative caterpillar fungus (chongtsao) which means that locals can earn a lot more from foraging than guiding you. 7. Do I need to hire a guide? Yes, yes and yes. Firstly the route is not easy to find or follow, especially if there is bad weather such as mist, rain and snow. Secondly, the kora is a trip into a very isolated infrequently travelled region where there are no villages or sources of help should you have an accident. If you became stuck because of a sprained ankle or got lost due to bad weather, you could not expect there to be any 'passers by' to render assistance - at best there might be one or two groups a week doing the kora. Thirdly, a guide is needed to liaise and communicate with local people you may meet en route, especially if you don't speak Chinese (or the local Tibetan dialect). Yading Tibetans are generally friendly and helpful, but misunderstandings can easily occur over trespassing or expected payment for services such as food or assistance. A guide will take care of all that for you - and also carry your bag! The best place to arrange guides is though the guesthouses at Yading, or possibly Riwa. Expect to pay 300 yuan a day for one guide and mule. Few people understand English so you will need to get someone to translate your plans to the guide. 9. Is there phone/wifi/internet coverage/power to recharge my phone on the kora? Expect to pay 300-400 yuan for admission to Yading National Park. The admission ticket alone is something like 250 yuan, and you are also compelled to use a 80 yuan shuttle bus to get there from Riwa (no private cars or buses. taxis etc allowed). There is also 80 yuan fee for the electric buggy service that runs up to Luorong from Chonggu monastery (though you can walk this bit). 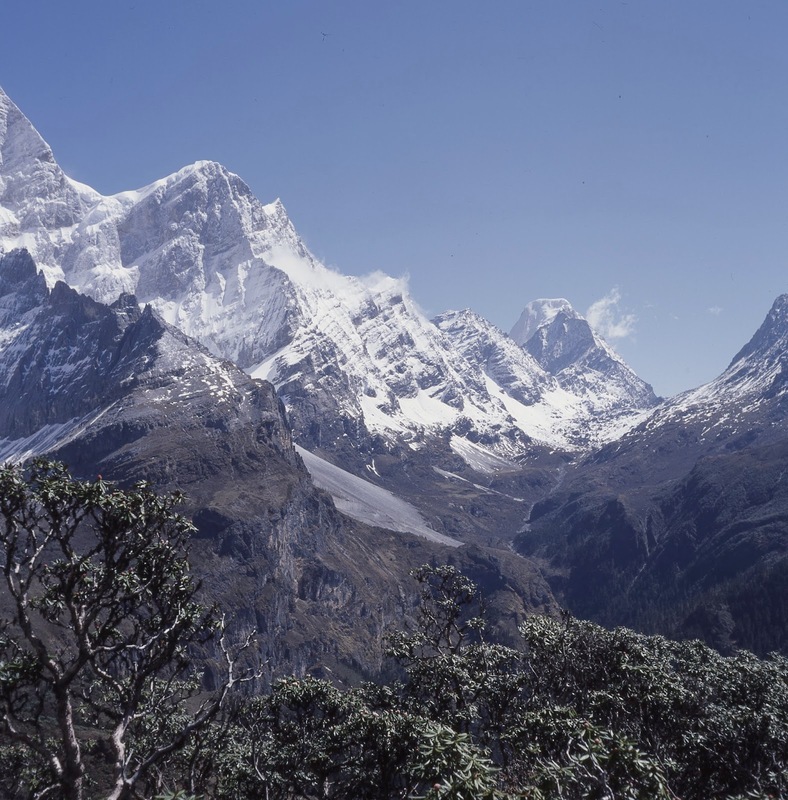 Recent reports from Yading have stated that the local government has banned trekkers from entering or leaving Yading by unauthorised routes such as the popular Lugu Lake/Muli/Galuo trek and the even moe popular Devil's Canyon side trek. I've also read that officially 'free camping' is no longer permitted but I've never seen anyone who would enforce these rules beyond the popular Luorong valley. However I have found park staff there to be very officious enforcers of the rules. By bus you can travel from Chengdu to Daocheng in two days via Kangding (stopover) and Litang. Then a private hire van or motorbike to Riwa aka "Shangri-La". As I mentioned, from Riwa you can now only enter the park by the official shuttle bus (but you could hike in from Riwa up the valley to Chonggu in one day). It's also possible to get to Daocheng from Yunnan via the other "Shangri-La" (formerly known as Zhongdian). The bus travels a twisting road in one day, via the town of Xiangcheng. If you want to get to Daocheng in an hour, there are daily flights in to Daocheng-Yading airport (40km north of Daocheng) from Chengdu. I tried it, it's a great flight. By the way, this being a blog about Joseph Rock I should mention that you could follow in his footsteps and get to Yading on foot, from Muli via the Shuiluo valley to the east. In the era of the good road from the north, I don't know many people who does this nowadays. Some Chinese trekkers do part of this route from the Shuiluo valley (often starting from Lugu Lake), which they call the 'Rock Trail'. 12. Accomodation? Do I need camping equipment? Increasing visitor numbers is putting pressure on accomodation in tiny Yading village, which has only about six guesthouses. Book ahead, don't expect to get a place if you arrive without a reservation. Many people now stay in Riwa, where there are more guesthouses, a youth hostel and some posh hotels. On the trek itself you will definitely need a good tent and a winter sleeping bag. There are no villages or places to stay on the kora route except for some decrepit bare stone shelters that are in varying rates of disrepair (some don't have roofs). So you will be camping and must be prepared for severe conditions including snow, hail, flooding rain, thunderstorms etc. You may be lucky some nights and your guide will arrange to sleep in one of the shelters or temporary tents used by the locals who are foraging for chongtsao - but don't bank on it, even as an emergency backup. There are suitable grass sites for camping on each section of the trail, all with sources of water (that should be purified). 13. Do I need to take food and water? Stove? You must be self sufficient in food for seven days. There is nothing available en route. One or two of the temporary Tibetan herder/forager sites might have a makeshift shop selling noodles and cans of cola. But do not rely on this. You will need to cook your food and that means a camping stove (unless you are prepared to forage for firewood and get a good fire going - possible, but hard work). Stoves and camping gas canisters can be bought in the outdoor supplies shop in Daocheng's main square. There is only a very limited stock of basic food and supplies in Yading village shops. Do your last shopping in the supermarkets of Daocheng or Riwa. There is reasonable water available from streams en route - I used iodine water purifying tablets and survived without any tummy troubles. For food I found that instant noodles did the trick for me most days, with just a few variations on dehydrated meals and a few extras. For lunch and snacks I relied on wholemeal crackers and cheese, which kept surprisingly well for a week. If you want to eat with the local Tibetans they live on tsampa (barley flour), yak butter tea and dry momo bread, with occasional bowls of spicy noodles. 14. What other gear will I need or be useful? Yes, definitely, if you are coming from outside. Expect thumping headaches, waking at night with a dry mouth and thirst - and lethargy - wanting to lie down and doze off when you're walking. Altitude also means that your uphill walking ability is massively impaired. What would be a gentle uphill slope at sea level becomes a gut-busting struggle that leaves you gasping for breath after 20 paces when you arrive in Yading. The rule is, I believe, to acclimatise slowly at a rate of about 500m ascent per day above 3000m. Since Riwa is about 3500m that means at least three days. I found that the Magic Bullet for me in terms of altitude effects was Diamox. You have to start taking it two days BEFORE you arrive at altitude. I was fine with this and a couple of weeks of physical activity training before the trek. Meanwhile, I saw otherwise-fit Chinese guys half my age really struggling to cope with the altitude. Their Chinese Traditional Medicine remedies didn't seem to be helping them. Yading is not an inherently dangerous place. The main hazards that you face on the kora are the same as you'd face on any comparable trek in alpine areas: weather and the elements (cold, exposure, exhaustion, heatstroke, sunburn, lightning strikes) and the terrain (falling off cliffs, tripping over and breaking a leg or spraining an ankle). There are no especially dangerous rivers to cross, but some creeks and streams have to be surmounted by logs or makeshift wooden bridges. In winter there are ice and snow slopes on the passes. As I mention in my blog there are two particular sections of steep track on Days 3/4 at the back of Jambeyang that are quite exposed and would result in serious injury/death if you slipped from them. There are no particular nasty creatures such as bears (well there are reputed to be bears, wolves and leopards but I never saw any). There might be a vicious Tibetan dog with some of the local nomads, though I never encountered any in this area (unlike other places such as nearby Muli and Deqin). If you're travelling with mules you might either fall off or get kicked by them (stay well away from rear). The local Tibetans are mostly friendly, honest and helpful if encountered in remote areas, but can be a bit gruff and unsympathetic if they have been exposed to tourists at Yading. If you do have a serious incident and require help or evacuation, the Yading authorities now charge a basic fee of 20,000 yuan for providing 'mountain rescue' services. I take out travel insurance (with outdoor activities extra cover) but I've always wondered if and how they would med-evac me out of Yading if I got stuck there. 17. What about the 1-2 Day 'Inner' Kora? Not much fun if you ask me. The first half, up Luorong valley to the pass between Jambeyang and Shenrezig, has some great scenery but you have to share the route with 5000 other Chinese tourists, some on horses or even being carried up on sedan chairs to the two lakes. The track is crowded and you sometimes have to wait for bottlenecks to clear or to pass slow walkers on narrow sections. Some visitors play loud music on their phones. Frustrating. Luorong valley is also spoiled by the recently built huge concrete road that carries electric buggies up with tourists from the reception point at Chonggu monastery. The second section, beyond the pass round the back of Shenrezig is better, but much of this is slog along churned-up muddy track through bushland, without any great mountain views. The mini kora involves crossing another pass before returning to Chonggu monastery. Sprightly Tibetan grannies walk this mini kora in a single day - but it's quite a stretch if you're not acclimatised. Best to allow two days and stay overnight at the huts/campsites between the first and second passes. See my blog for Day 6 and 7. Michael, this has been incredibly useful to planning! If you could email me the Google Earth waymarkers I would be immensely grateful. Thanks! Brendan, Melbourne.